Winners must email Sue at sue@suebleiweiss.com with their full name and mailing address by 4/14/11 in order to claim their prize. 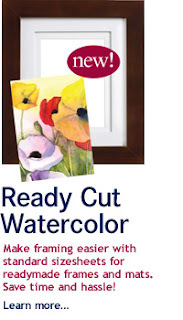 Three lucky winners will receive a package of Ready Cut Watercolor sheets! 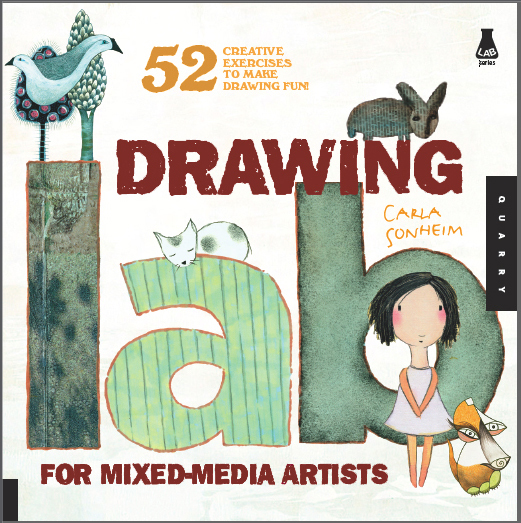 A copy of Carla's book Drawing Lab: 52 Creative Exercises to Make Drawing Fun! 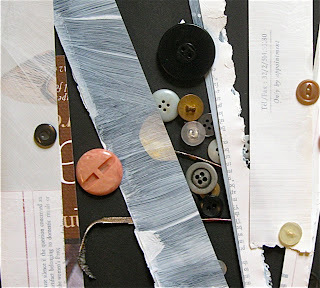 making mixed-media art every day! It's taken me quite a few years to actually refer to myself as an artist, but that's what I finally realized I am. My media of choice include fabric, paper, watercolors, camera, and computer. 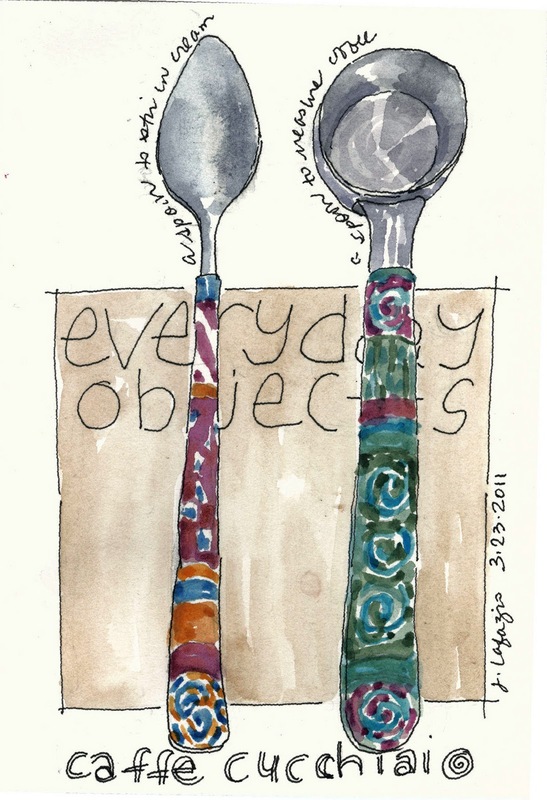 How has the sketchbook challenge influenced your sketchbook keeping practice? 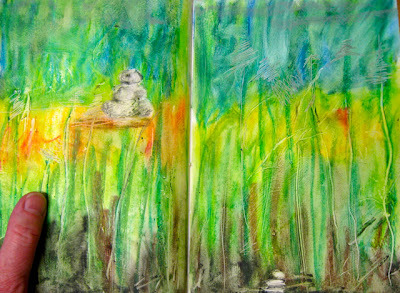 The sketchbook challenge is helping me to use my sketchbook more by giving me more ideas to put into my sketchbook. 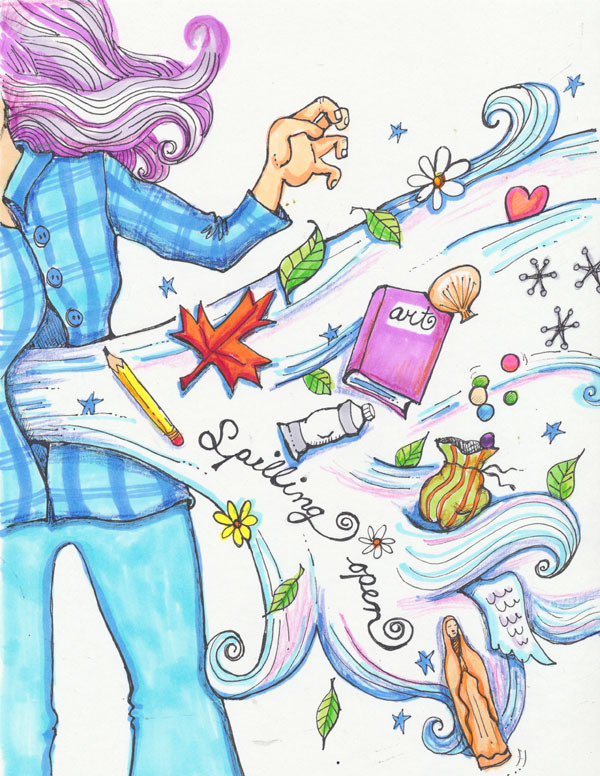 Tell me how you're approaching each challenge - do you jump right in and start sketching as soon as the new challenge word is posted or do you reflect on it first? I reflect on it first, which is the way I do most of my creating. I don't come up with ideas quickly, but given enough time, I can usually come up with something. I do most of my work in one sketchbook, but I have a few others that I work with some. 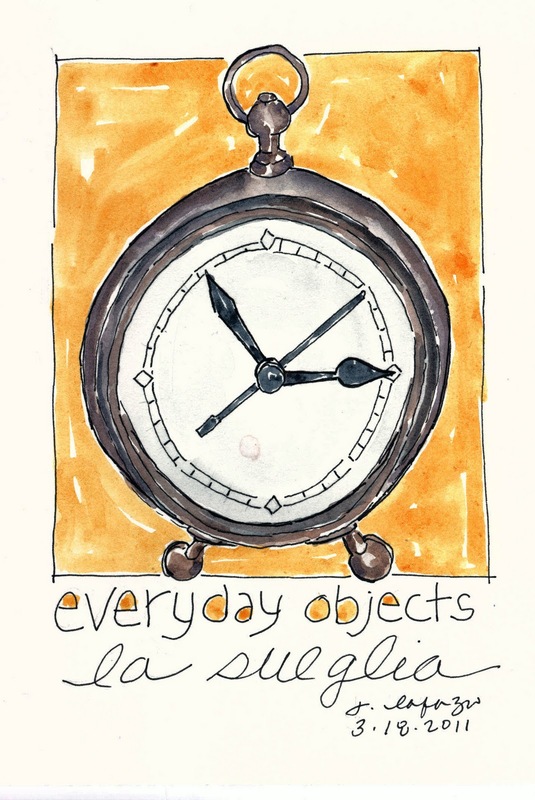 My goal is to make my sketchbook an everything book - for sketching and notes and reminders, etc. I'm not there yet, and I don't know whether I ever will be totally, but I'm working in that direction. What's your preferred format (sketchbook size, type of paper, single sheet,spiral bound etc?) and have you found your preferred medium for using in your sketchbook? 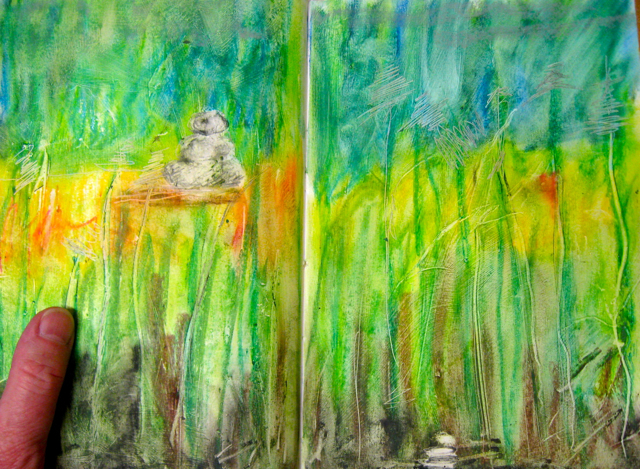 watercolor, pen, pencil, crayon, collage etc? My preferred medium at this point is watercolor and pen, but that is always subject to change. I used watercolor pencils when I first started. I haven't been doing this long enough to know yet what sketchbook format is best for me - I'm still experimenting with that. I prefer using cold press watercolor paper, maybe because it's what I've used the most. I bind my own sketchbooks, and I've done a variety of types. I like spiral bound (or o-wire) for the fact that I can open a book and turn the pages back on themselves, but sometimes the spiral gets in the way. 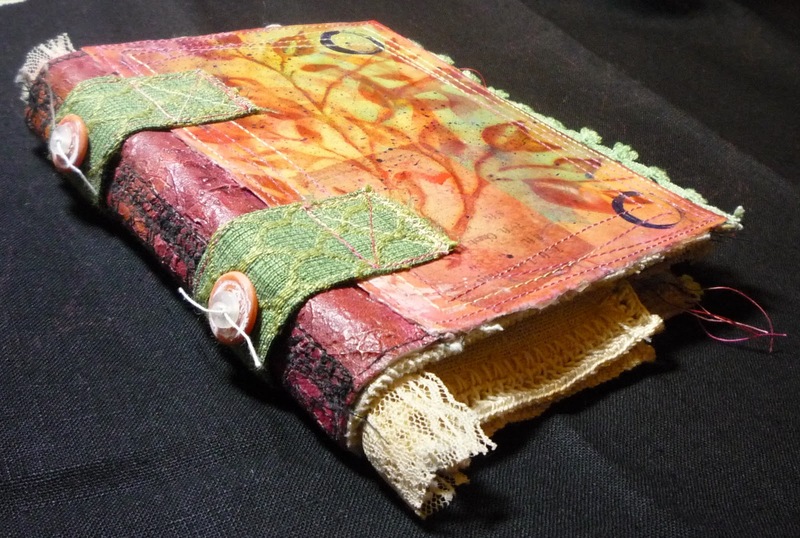 I'm getting ready to bind a new book, and I haven't decided on the structure yet. A good friend gave me Making Handmade Books - 100+ Bindings Structures & Forms for Christmas, so I'll be making something from it. The page sizes I've liked best have been 5 1/2" X 7 1/2" and 6 1/2" square. I take a lot of online classes, so many of my sketchbook pages (or journal pages, as I've been calling them) are from my classes. I really enjoy learning new things, getting ideas, and interacting with classmates. It's a fun journey! Kelli here. I tend to be very practical in the re-use of my sketches and drawings. 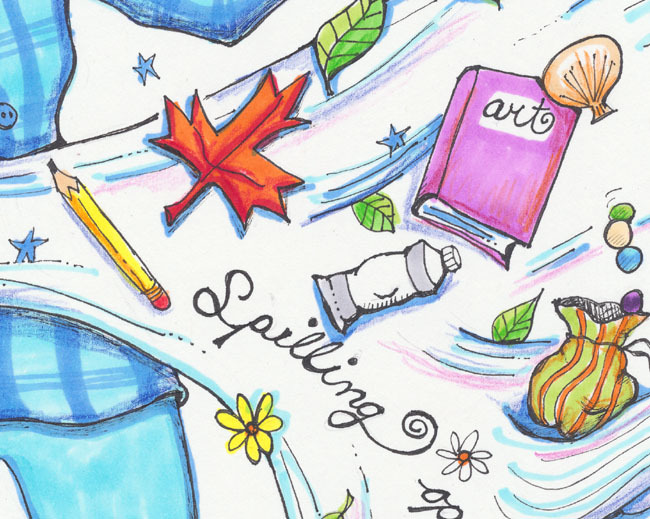 Once you've created artwork, it's fun to use it in a variety of ways. I've posted a video tutorial on turning a basic sketch into a soft case for an MP3 player. For mine, I've followed my own basic stitch imagery method, but it's quite adaptable to however you might choose to use your own sketches. In fact, it would be equally scrumptious to just scan and print an existing page from your sketchbooks, without regard to the specific subject. Anything in your sketchbook is fair game for re-use! This is Laura c-w, sending you greetings and warm wishes. February spilled into March, now March is spilling over into April. Here in the frozen North we are still enjoying gray, moist, chill. The hints of green are elusive. This year even the crocus are biding their time. My sketchbook seem filled with studies of cracks in the ice. These changes in surface fascinate me. I've been looking at the contours of some puddles as they expand and contract, the fissures in deeper ice, the fingers of thaw along banks. All interesting patterns. 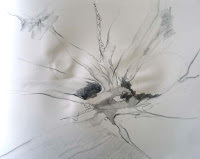 Basic tools include visual reference ( a rock with patterning similar to my idea/memory of ice, pigma pen, Derwent water soluble pencil, mechanical pencil, hard white eraser - for softening areas. the essential contours, drawn very quickly with the pencil on its side. Where will these studies take me? If the season changes quickly, I may find color more important as a stepping off point. 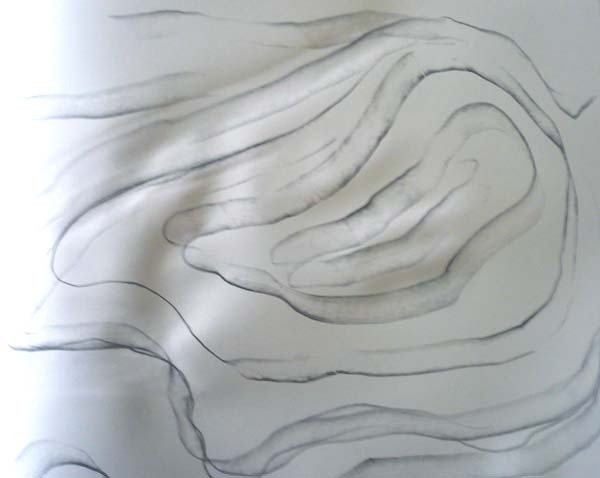 If the current conditions persist, I envision some soft painted surfaces exploring these lines and patterns. We'll see. Does the weather inform or influence your visual work? If so, how? I just absolutely love the theme this month! I love seeing how each of us, as well as the folks over at the Flickr site, are working with it. I've posted a couple of pages that the theme has inspired me to create. But this time, I thought I'd show how one of my sketchbook pages inspired me to take it a step (or ten) farther and create a piece of (functional) artwork. It all started out with a sunny day here in South Carolina. Imagine one of those old western movies - where the sun is beating down on the parched faces of the bad guys (or good guys!). Remember how they always made the scene all blurry... the only thing that you could identify was a partial outline of the sun itself? 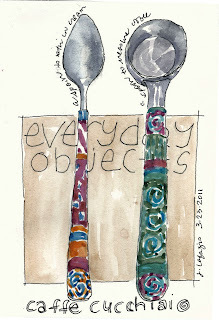 That's what the day looked like to me and what I wanted to recreate on my sketchbook page. 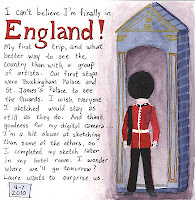 I had already painted some of the pages in my sketchbook, just waiting for the right subject to come along. I flipped through them and found just the right page for my sun - all pink and yellow with areas of white and tan to show the spots that I kept seeing. This is what I drew in my sketchbook. A blurry, wobbley kind of outline - I was trying to allow the color of the page to speak for the itself. 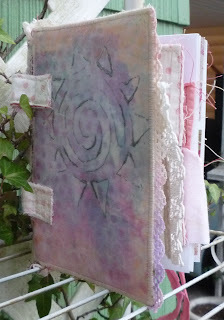 I've been making samples for a class that I am teaching in mixed media book making. I thought that the sketch would be a great cover for a book. I really loved the colors on this page and wanted to use it for something more. I scanned it into the computer and printed it out on a heavier weight paper. I also cropped the sun off of the page and printed out another copy for the back cover. After adding a few ingredients over my potion pot - the image was ready for its debut as a book cover. 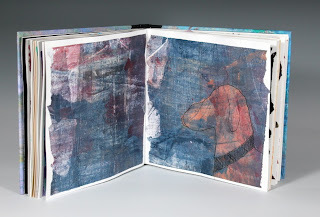 I've kept the sketchbook drawing/painting intact inside the little book and used my artwork for another purpose. 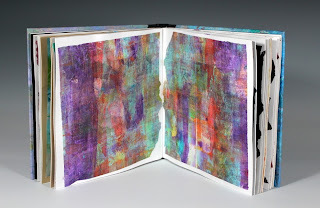 This is a great way to use your sketchbook pages for a piece of artwork! 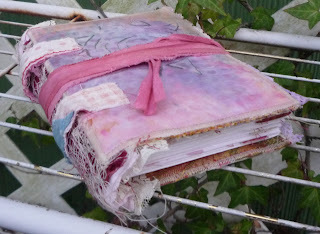 Check out more pages on my blog for other ideas. Hello! This is Carla Sonheim... how are you this week? I have been quiet. We are now in our third month, and it's time to admit to all of you that these themed challenges have been, well... a challenge! It seems every time I put pen to paper, and try to come up with something that goes with that month's theme, I freeze. Has this been happening to any of you? Lately I've been drawing lots of creatures in my sketchbooks — one to a page. But the other night I was determined to do a bunch of animals ALL ON ONE PAGE, my "nod" to this month's theme of Spilling Over. 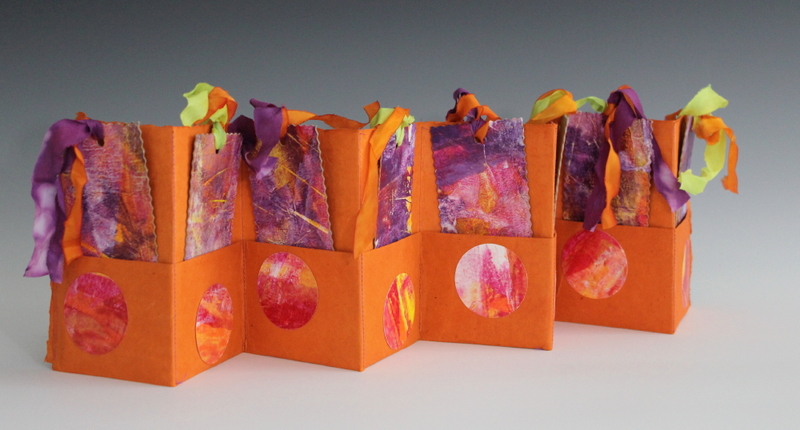 The tags in this accordion book were made by fusing some of my "off loading" papers to some heavy card stock. 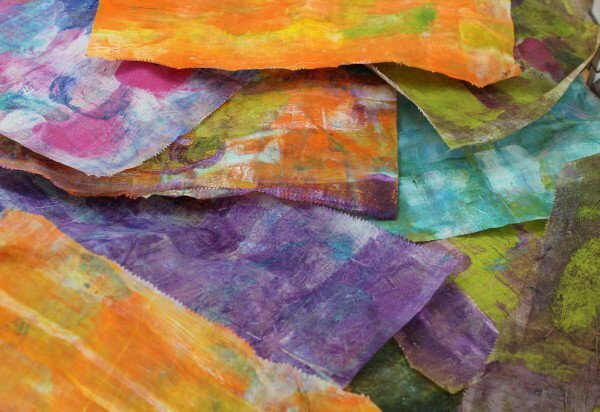 When I'm painting I either work on top of some scrap paper or some dry wax paper because I found that most often these scraps end up being covered in some very cool color combinations. The back of the tags are blank for sketching on. 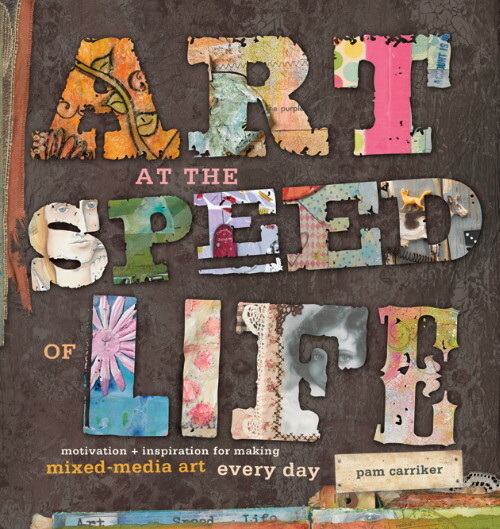 Every time I pick this book and flip through it up I find some new imagery in the paint splatters on the pages. I saw a dog in this one so I went back and added some lines with a paint pen. Speaking of books, I just finished a terrific book about creativity and drawing called The Confident Creative: Drawing to free the Hand and Mind by Cat Bennett. You can see my complete review on my blog here. I have not yet completed a Spilling Over page, but I do have another installment about painting with watercolor and didn't want to to go missing on this fabulous blog. 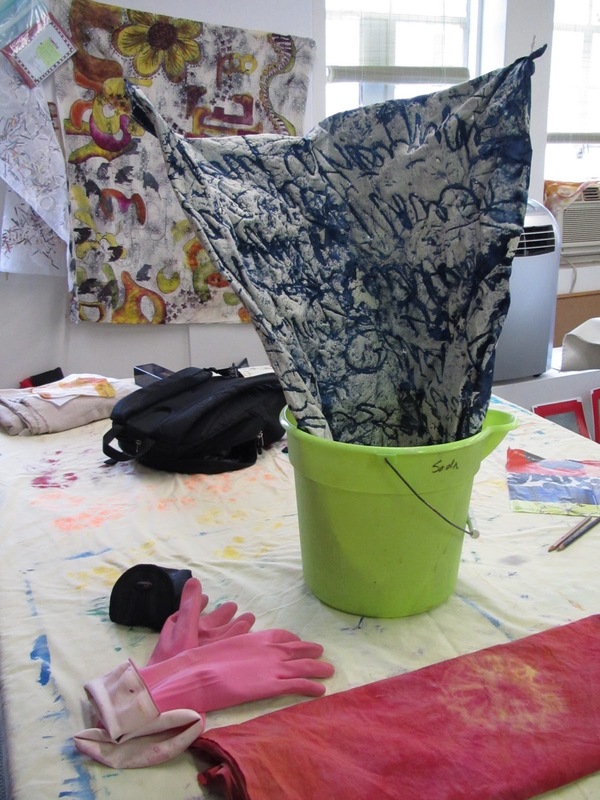 You will see that when you don't want a wet-on-wet look, where one color or pool of paint flows magically into another, you will want to keep the areas you are painting separate. They appear almost as islands onto themselves. You can then either dry them with a heat gun, or allow them to dry on their own and paint the remaining areas later. Watercolor and gouache is a magical paint, and requires some finesse. But the beauty of it is luminescent. Some of my sketches live in boxes. Here is one of my sketchboxes brimming over with tiny books. Bead books, pamphlet books and wee accordians. At the ready to be picked up and sorted through. Played with whenever I want to make more. 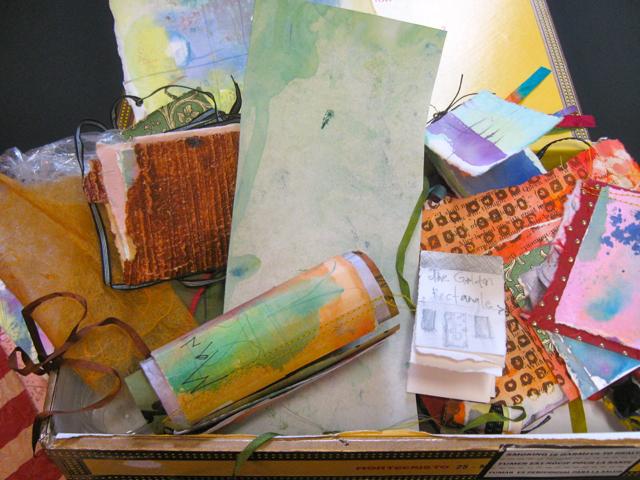 The box has extra painted papers and bits of threads, ribbons and odds and ends all ready to go. Below is a box of small paintings, studies and ideas for my NorthEast Kingdom cottages, See more here on Etsy and on my website under Paintings. I can dip in there anytime to finish paintings and start new ones. Cigar boxes, shoe boxes, flat baskets and bowls, they all work to wrangle the unruly batch of sketches. Let 'em spill out of the book and into the box. (hahaha). If you have an urge to read more about vessels/containers, I have a post here on my blog. 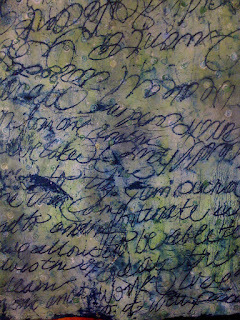 (Lyric here) Last week we had a fabulous time at the Cary, NC Sketch-In. What we lacked in numbers we made up for in laughter! And in some hard work! We did blind contour drawings of our hands. The post just previous to this one explains the process. Remember - it's about seeing - not about the drawing! 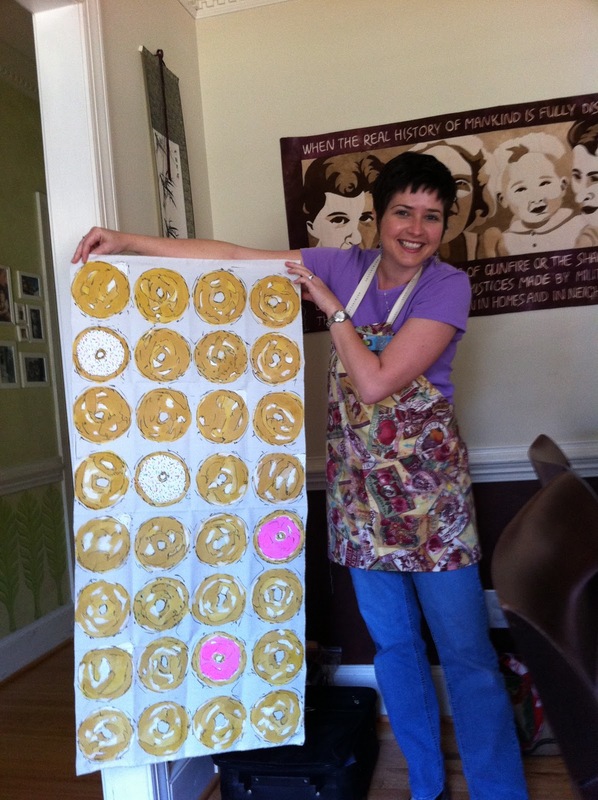 Hannah showed off some delicious fabric she had painted and Mary toiled away at some portraiture. I worked a bit on throwing paint at paper. Random marks with guache and a sort of stiff brush. 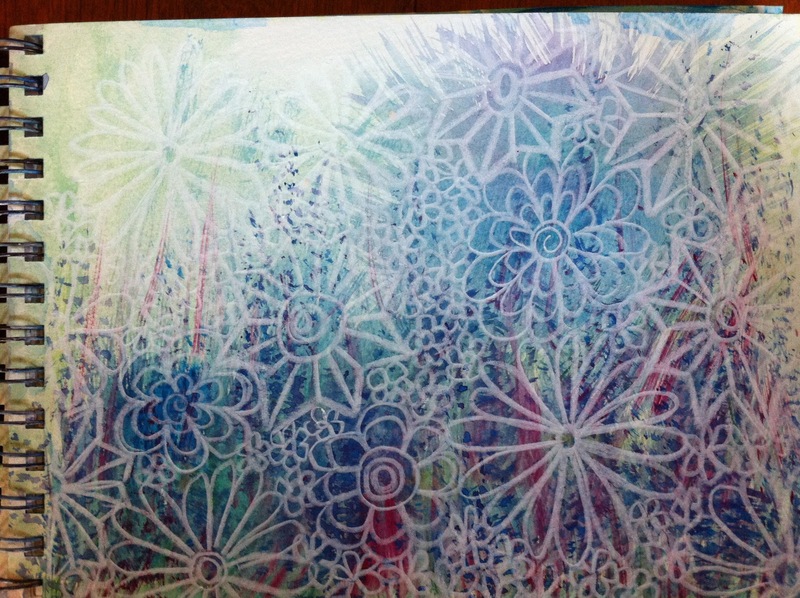 so I pulled out a white pencil and doodled oodles of happy flowers. inspired by a picture she took of her child's toy. 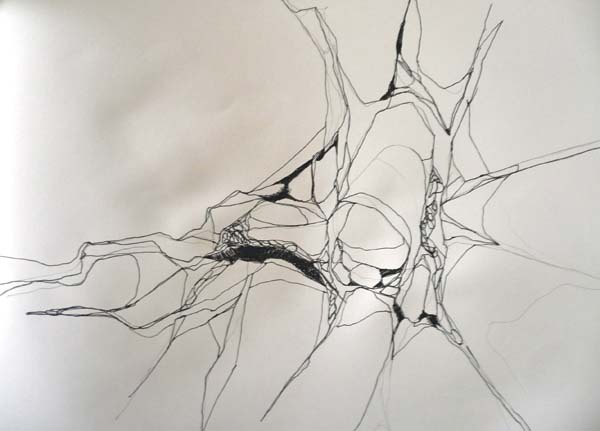 If you’ve ever taken a drawing class, you are probably familiar with the idea of drawing what you see with your eyes, not what your mind thinks you should see. In other words, really look at what you are drawing and respond to that, rather than some mental notion of what the object is. 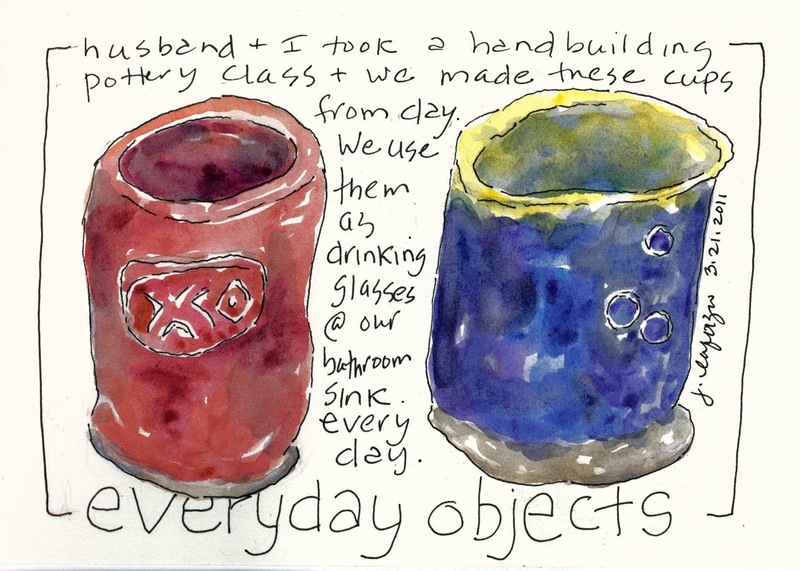 We could all draw a coffee mug, for example, from an image in our mind. 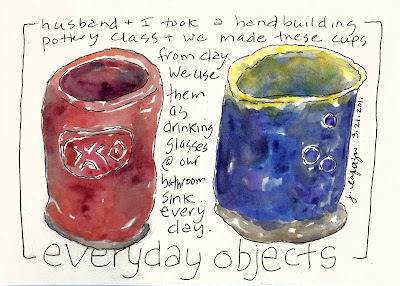 It is a different thing to really look at a particular coffee mug and trace its outlines. 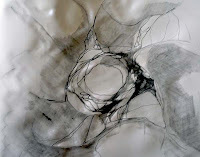 Drawing from imagination or memory and drawing from seeing are two different things, and practicing the latter will enhance your skills at the former. 1. First establish that this exercise is for your eyes only, unless you decide to share it. 2. Remember to approach the exercise with a sense of inquiry, not with a particular goal. It does not matter what the result looks like; what matters is that you approach it honestly and wholeheartedly. 3. Set up your mirror so you can see your face. 4. Slowly and carefully, draw your face with white crayon on the watercolor paper without looking at the paper. Look at your face in the mirror only. Take your time. 5. 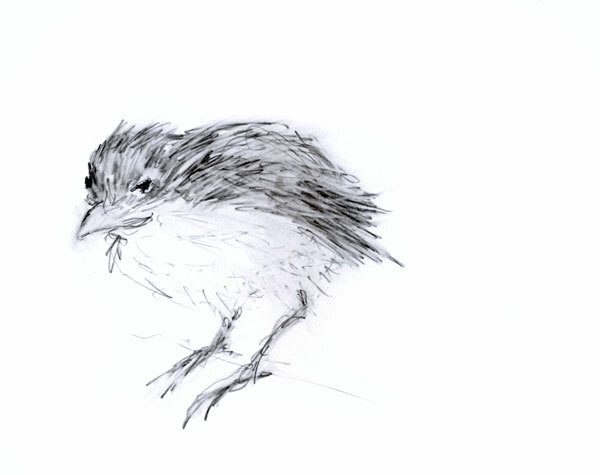 Brush water over the drawing, then paint over it in watercolor to reveal the drawing. Put it aside to dry, and repeat the process. 6. 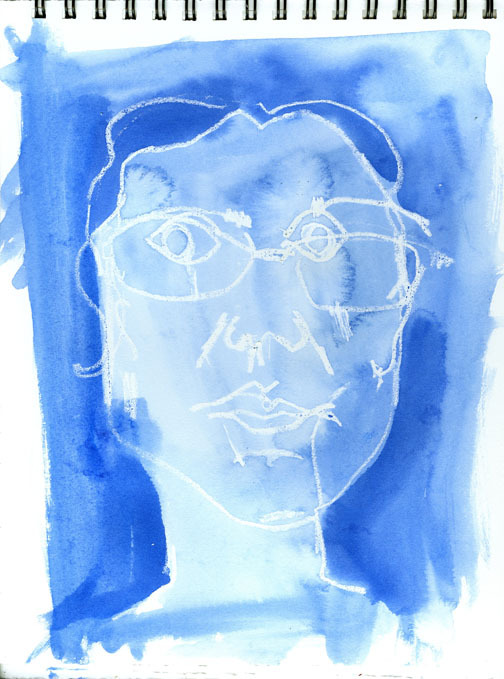 After a few blind self-portrait drawings, try a few with pen on the drawing paper or in your sketchbook, both blind and looking at your paper. Even when you are not doing a blind drawing, look more at the subject (your face in the mirror) than at the paper. Making self portraits, for me, is one of the most effective ways of practicing letting go of looking good. This letting go not only helps you to see better, but it cultivates acceptance. Sometimes it is hard to accept how age affects how we look. We’re tempted to leave out that wrinkle or make our eyes look bigger and more youthful. Resisting this temptation not only encourages acceptance, but will result in much more beautiful and interesting drawings. I've been making samples for a book making class that I have coming up on March 22 in Asheville NC. 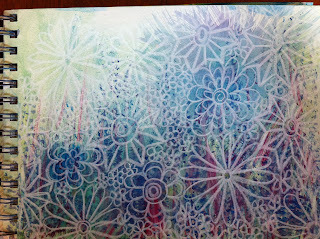 I use scraps of watercolor paper that I added layers and layers of paint on. I love making these papers to use in my artwork. I made the book covers out of them. 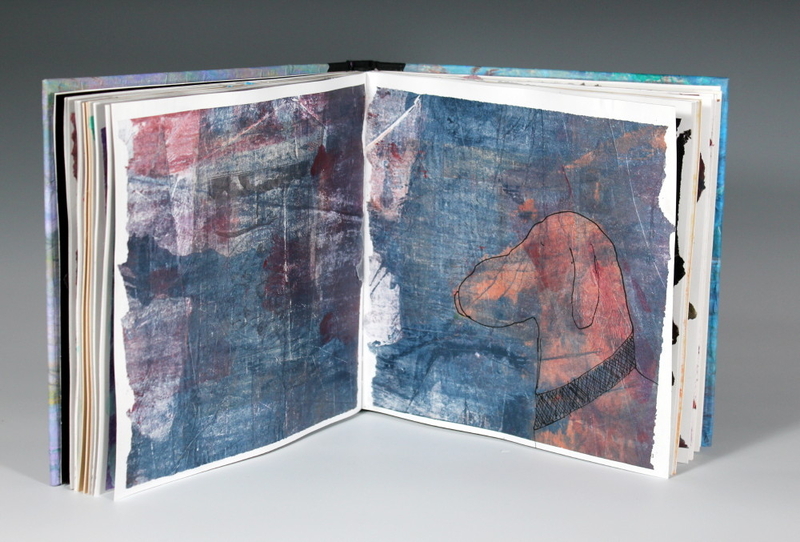 And here's a shot of a couple of pages that I have sewn inside the book. Not all of the pages are painted at this point. I usually keep these small books to the side of my work table and as I have extra paint (or ink) left over at the end of a work session, I smear them onto one of the pages in whichever book I grab first. 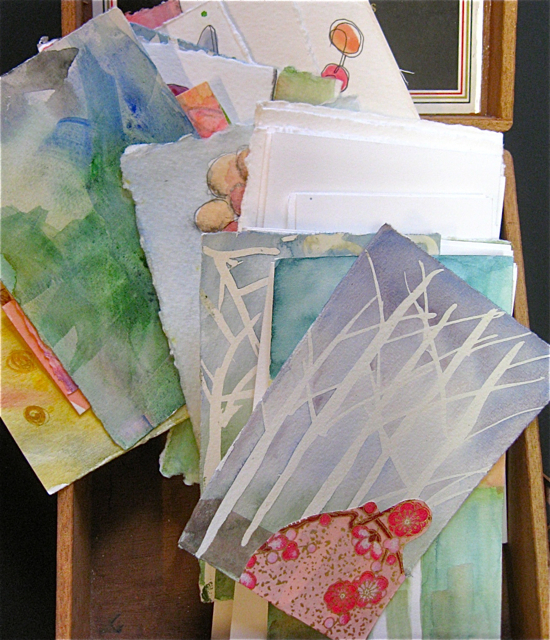 You could say that my studio is spilling over with painted papers. So, your sketchbook/visual journal/art journal doesn't always have to have actual drawings in them - sometimes I just use mine to try out color combos, new painting techniques and possible resists. They all hold my artwork - my secret art yearnings. They are all spilling over with my artwork. Leslie here. 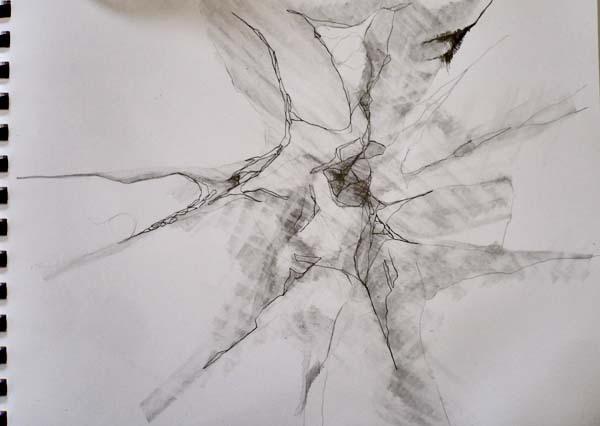 I am fascinated with the effects of pressure on things: cracks in surfaces are a source of endless inspiration to me. I will often return from my travels with bizarre images of street surfaces and the sides of buildings. I think this is the legacy of having an architect/structural engineer father. How things fit next to one another (think piles of stones) is another obsession. But, I digress. I tried and tried to get potato dextrin (potato starch) to play nice, but I never could achieve the desired results. Enter the humble sack of flour. 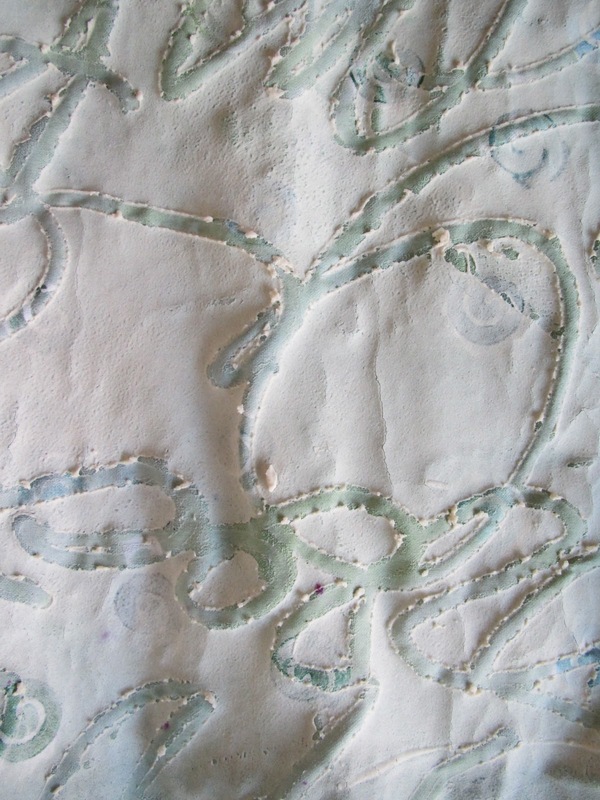 Flour is cheap, accessible, and a wonderful surface design tool for the textile artist! The results can vary depending on the thickness of the flour to water mixture. For the following tutorial I mixed the flour paste to resemble thin-ish pancake batter. 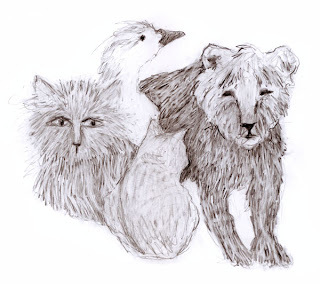 The cloth I will illustrate is part of a round robin exchange. The color was a bit muted for my personal taste, but a bigger concern to me was that the imagery on the cloth was of only one scale, and not really interconnected throughout the piece. While not completely unattractive, it just didn't excite my imagination. that was previously covered with a dropcloth. A thin layer of the flour mixture was spread on a limited area of the cloth with a squeegee. 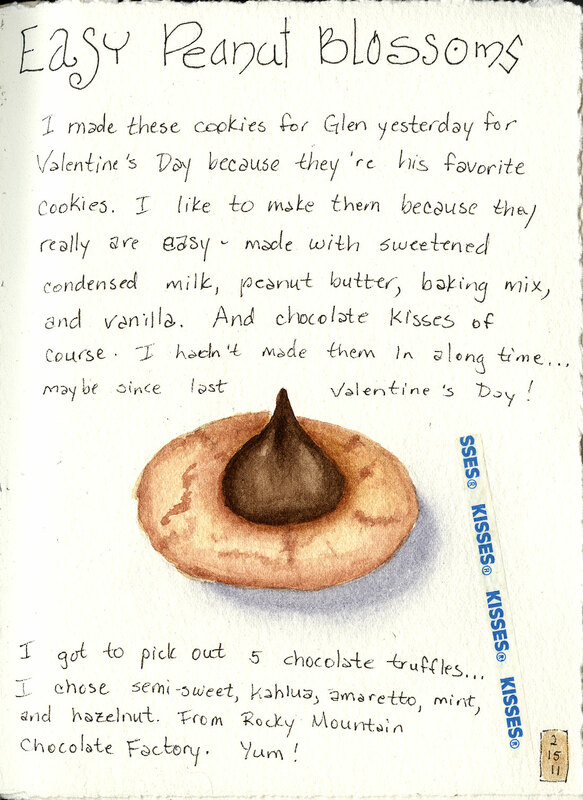 Using a rubber-end tool for manipulating oil paint, I wrote into the wet flour mixture. Note: the tip of a brush handle works for this, too! I don't worry about it too much. The flour paste mixture begins to dry fairly quickly. 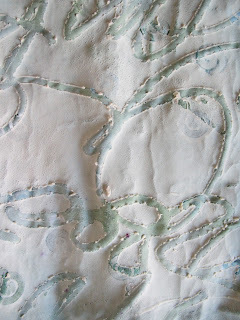 That is why it is best to spread the flour paste on areas of the surface when writing into the paste. For an overall crackle, spread it on the entire surface. As soon as the resist begins to dry, it will buckle. 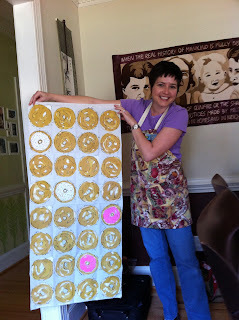 It will pull your pins out from the print table, so you might as well pull them out as soon as you are finished spreading the flour paste and making your marks. Once the piece has partially dried, you might want to gently lift it off the table and hang it someplace. You want the resist to be completely dry before proceeding. 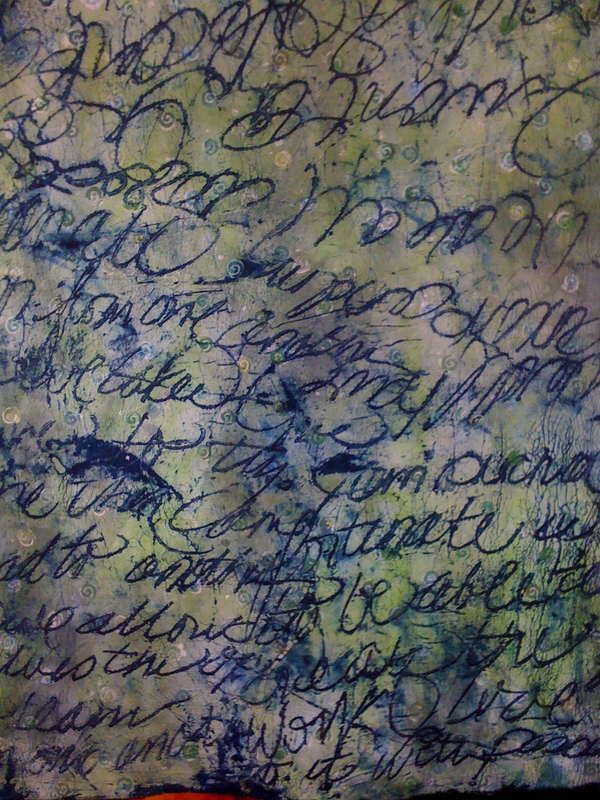 To create the crackled texture with dye, mix procionMX into print paste. Push the dye mixture into the dried resist. For this piece, I used a large round brush with plastic bristles and used a combination of brushing and "pouncing" motions to assure the dye penetrated through the open areas of the resist. Once again, pick up the cloth (if possible) and hang it in an open area to dry. If this is not possible, simply leave on the print table and allow to batch completely. This is what the back of the cloth looks like after the thickened dye was applied. It is very stiff and crusty! To dissolve the paste resist, immerse the cloth into a bucket of water with a small amount (1tsp) of synthropol or other surfactant, and soak. Use care when disposing of the water mixture: you may want to dump this out in the bushes near your studio rather than pour down the drain, depending on how new your plumbing is. It is something to consider with many of the popular resists. I soaked my cloth twice to remove as much of the flour paste and thickened dye as possible before washing in the machine. 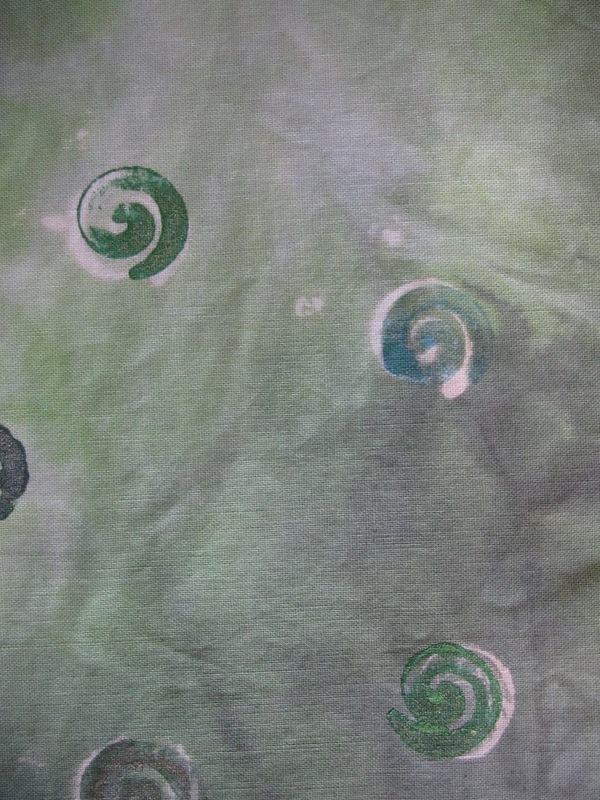 A bit of synthropol prevents dye migration into the open areas of the cloth. look at the beautiful crackled surface! It just took a little flour and water, and a bit of time to dry between processes. 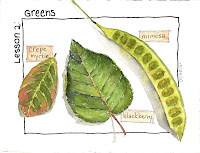 I am planning to try this technique on a variety of papers. I hope you will try it, and let me know how your results turn out! Diana here with the Cat in the Hat today. "The sun did not shine. It was too wet to play. So we sat in the house all that cold, cold wet day. Too wet to go out and too cold to play ball. So we sat in the house. We did nothing at all." Nothing.at.all. Until Thing 1 and Thing 2 popped out of their boxes. I've always wonder if Doc Seuss wrote this to Creatives as well as kiddies. 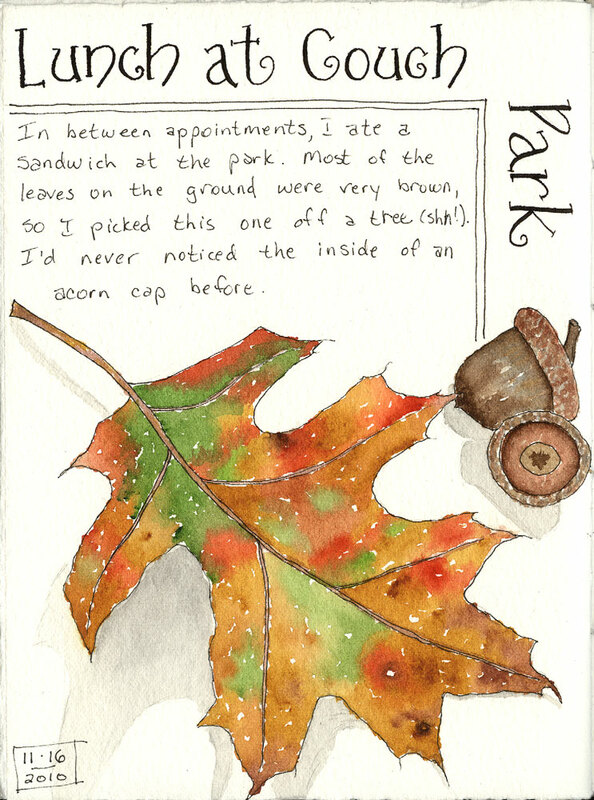 It was a cold, cold wet day when I did this sketch. I like to get out the jar of gesso and do over a couple of pages in advance. I slop it on there, leaving ridges and bumps and scumbled areas. 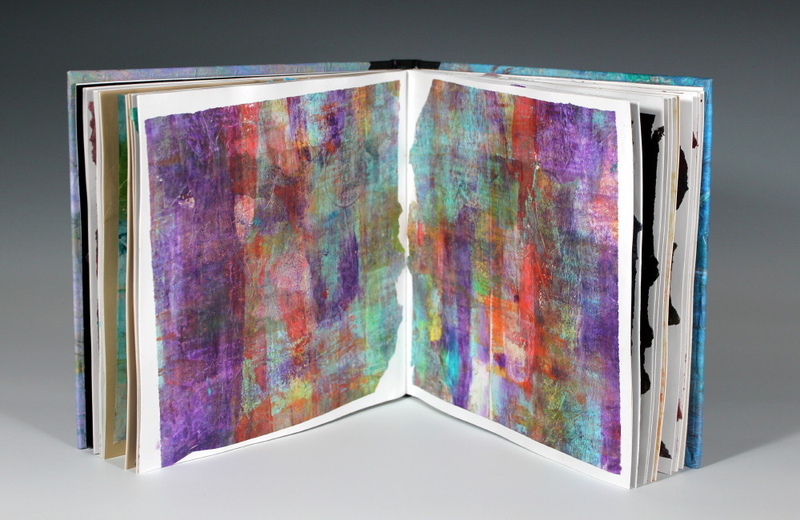 This layer of paint will seal the surface of the paper so that the Portfolios can later be scraped. I'm sure craft store acrylic paint would work fine too. Just use a light color. When the Portfolios want to jump out their boxes, they are free to run around on a clean, white gessoed page. Yummy and delicious, I say! Scribbling different colors of Portfolios and then smearing them around with my fingers is way more fun than T1 and T2 were having. I use my fingers like brushes and push the color in any direction. After this part is done, draw and scrape into the color with a fingernail, skewer, toothpick, pencil or anything else you have on hand works. You can take a damp brush and and kinda push the color around too. Even rub out spaces, like I did where I have the stone piles. Oh yeah, where is that Cat with his Picker Upper Machine? I sure could use him. 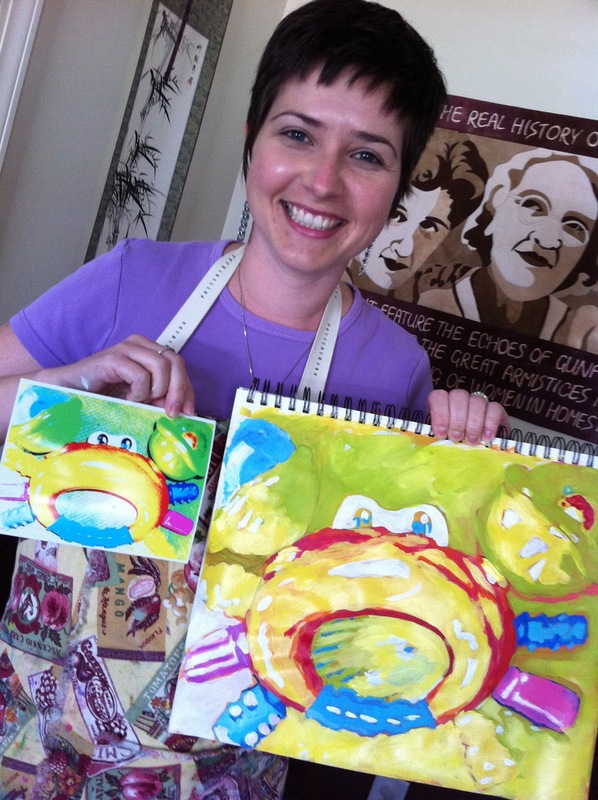 Now stop reading this blog, leave a comment and have a bit of art fun this weekend. This is my sketch for the Spilling Over Theme for March! Hope everyone is have a great month! Sketch-In - Cary NC tomorrow! Just a quick reminder - Sketch-In tomorrow 10-12 in Cary, NC. They're pretty far from perfect I know, but I'm actually starting to enjoy the process of drawing which is a good sign because as long as I'm having fun with it, I'm more likely to stick with it! Face to Face and a Sketch-In in N.C.